Home » Tech Tips » Apps » Disable Curly Smart Quotes and Type Straight Quotes in Word and Pages? Disable Curly Smart Quotes and Type Straight Quotes in Word and Pages? Microsoft Word is a powerful word processing package. We use MacBook for daily use, yet prefer to use Word for documentation. One of the frequent problems we face is to type the straight or neutral quotes. Sometimes we prepare or analyze small program codes in Word which needs straight quotes. However, when you type single quote ‘ or double quotes ” in Word, it will automatically convert it to curly quotes like ‘ or “. This is embarrassing, as curly quotes will break the coding when you copy and use the code for real usage. How to Type Straight Quotes in Microsoft Word? It is just a simple setting to disable the curly quotes and get back the straight quotes. Launch Microsoft Word and open you document in which you want to type straight quotes or change curly quotes. Go to “Files” menu and click on “Options”. Navigate to “Proofing” section and click on “AutoCorrect options…” button. Go to “AutoFormat As you Type” tab and look under the first section “Replace as you type”. Disable “Straight quotes” with “smart quotes” option. Click “OK” to close all open windows. Now when you type single or double quote, Word will show you the neutral or straight quotes. In addition, the settings will be permanent in such a way that Word will only show straight quotes in any new documents. If you have lot of curly quotes to replace in a Word document then use find and replace feature. Curly quotes have different format for open and close quotes. Therefore, you need to replace both open and close quotes with straight quote. Open your document and copy one of the open curly quotes. Press “Control + H” or go to “Home” menu and look for “Replace” option under “Editing” tab. This will open find and replace dialog box. Paste curly quote in the “Find what” text box and type straight quote in the “Replace with” text box. You can use “Find Next” button to search the curly quotes and use “Replace” button to replace instance by instance. Alternatively click “Replace All” button to replace all quotes in single click. Continue the same process for replacing all the closing quotes in your document. Use code editors like Notepad++ or Brackets for programming purposes. At least use Notepad for typing simple codes. Use Word only when you have special requirements like inserting small piece of code in-between regular text. As far as we have checked, you can use either curly or straight codes but not both on same document. You need to disable the auto correction settings to toggle the quotes. The other good option for using both quotes on the same Word document is to use alt code shortcuts in decimal or hexadecimal format. Enable the curly quote option, so that Word will always use curly quotes. When you want straight double quotes, press one of the alt keys and then 3 and 4 keys from number pad. If you do not have separate number pad on your keyboard, type 22 then press alt and X keys. This will create straight double quotes. Similarly, for straight single quote, press alt then 3 and 9 keys. Alternatively, type 27 then press alt and X keys. Learn how to disable smart quotes in WordPress. Open your Word document on Mac with Word for Mac. Press “Command and ,” keys to open Word preferences. Alternatively, go to “Word > Preferences…” menu. Go to “AutoFormat as You Type” tab and look under “Replace as you type” section. Disable Smart Quotes in Pages? 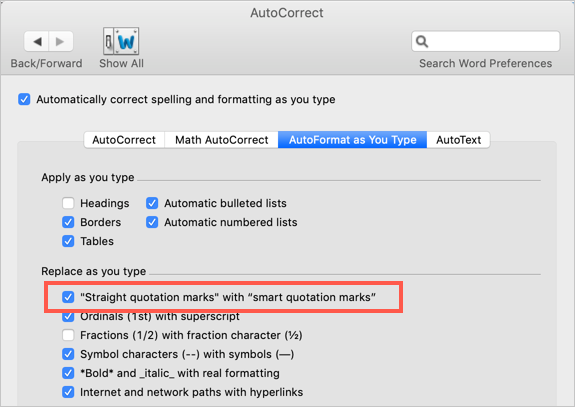 If you are using Pages or any other Apple documents, simply go to “Edit > Substitutions” and disable “Smart Quotes” option. This will help to type straight quotes instead of curly quotes. However, you need to search and replace all existing quotes similar to Word documents as explained above. We strongly recommend to use dedicated code editors like Brackets for typing program codes. However, for small code snippets inside an article needs to have careful quotation marks. So that users of the documents can copy and paste the code without difficulties. 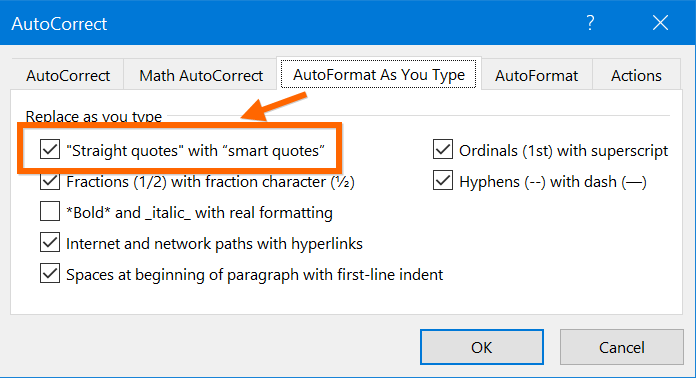 Use the above explained methods for Word and Pages to disable smart quotes and use straight quotes when required.